Powdery mildew on aster plants will not necessarily harm your flowers, but it doesn’t look very nice. 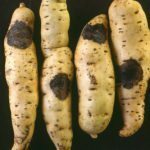 This fungal infection feeds on asters and other plants, but it can be prevented and treated by minimizing the conditions that promotes its growth and using fungicides. 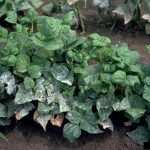 Powdery mildew is caused by a fungus. There are several species that cause the infestation, each evolved to be parasitic on certain types of plants. That means that if you get powdery mildew on aster plants, it will not infect plants from other families. The fungus grows on the surface of leaves and reaches into cells to feed on nutrients. It needs the plant to be alive to grow, so it actually favors conditions that also favor the host plant. You can recognize aster powdery mildew by the white to gray powdery patches on the surface of leaves. They will spread and grow, eventually covering more of the leaf surface. The plant may stay healthy for a long time before the leaves finally dry and whither. Avoid getting the leaves of asters wet. Water only at the roots to minimize humidity around the plants. Clear out debris from the bed in the fall. Remove and destroy any foliage that is affected by powdery mildew as soon as you see signs of it. If you notice signs of powdery mildew on aster early, you can probably manage the situation and prevent the fungal infection from spreading to other plants. If you can’t get the infection under control by managing the environment, you can try treating the affected plants with chemicals. Visit your local nursery or extension office to get the right kind of fungicide for powdery mildew. Apply the fungicide every ten days to two weeks. If you still struggle to control powdery mildew, you may want to clear out all the asters from the affected bed, destroy them, clean out the bed, and try growing asters again or put in another kind of plant that is not susceptible to the infection.